BAGHDAD, Iraq (CNN) -- The ongoing presence of U.S. troops in Iraq "shows that the (Iraqi) government and the occupation are not serious about the withdrawal," a key Shiite cleric in the country said Wednesday. A crowd gathers Tuesday after a deadly bombing in the northern Iraqi city of Kirkuk. Muqtada al-Sadr made the statement on his Web site a day after U.S. forces withdrew from Iraqi cities and towns in accordance with the security agreement between the United States and Iraq. About 131,000 American troops remain in the country, on bases and in outposts outside of population centers. "The withdrawal should include all the occupation forces: army, intelligence, militias, and security companies and others. Otherwise, the withdrawal will be uncompleted and useless," al-Sadr said. "We want a withdrawal and stopping the interference with Iraqi political, social and economic affairs," the statement said. Al-Sadr commands the loyalty of the Mehdi Army, one of the largest independent militias in the country. His agreement to a cease-fire with the government and its allies is considered a key factor in reducing the level of violence in the country. But he seemed to suggest Wednesday that Iraqis had the right to attack foreign forces in the country -- if not Iraqi security forces. "If the occupation forces violate this claimed withdrawal, even with a government cover, then the people of Iraq will have all the right to express their opinion in a peaceful way, and the right to self-defense on condition of not harming the Iraqi people and the security forces," he said. Under an agreement signed in the waning days of the Bush administration, all U.S. forces will be out of Iraq by the end of 2011. Most will be gone by August 2010 under the withdrawal plan laid out by President Barack Obama, Bush's successor. The U.S. troops who remain are now tasked with supporting Iraqi troops and police, and must seek Iraqi permission to launch operations in the cities. the top U.S. general in the country said Tuesday that much of the country was safe. "There is not widespread violence in Iraq," Gen. Ray Odierno told reporters in a video conference from Baghdad. "There's still gonna be bumps in the road. There's still gonna be violence here," he added. 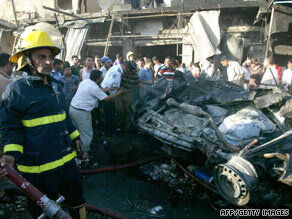 Meanwhile, the death toll from a huge blast in northern Iraq rose to 35, local security officials said Wednesday. The car bombing took place in a busy commercial district in a predominantly Kurdish area of Kirkuk early Tuesday evening when the neighborhood was busy, security sources said. About 17 shops and houses were destroyed and 95 people were wounded, a police official in the Iraqi city added. Kirkuk is about 378 kilometers (235 miles) north of the capital, Baghdad. CNN's Yousif Bassil and Jomana Karadsheh in Baghdad contributed to this report.